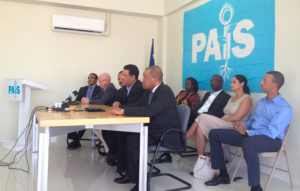 WILLEMSTAD – The PAIS party will not participate in the elections scheduled on April 28. The party is not ready. This is according to the new party chairman Jerry Semper. One of the reasons for dropping out of the race is that a committee that seeks out what went wrong during the last election, has not yet completed its analysis. To many people's surprise, the party did not manage to get not even one seat in parliament. The party went from 4 seats to 0. Another factor is that the party does not have the funds for a solid campaign.